Welcome back to My First Review! In last month’s introduction to this feature, I told you how the first review I received influenced the first review I wrote and ultimately began my interest in this project. Today, using my actual first review, I’m going to begin our series of features by showing you my first review. Two factors led me to get that first review done, a very enthusiastic Steven Briggs , and my L2 Advancement. You can read the full story here. I chose my good friend John as the subject since he was, and still is, one of my primary mentors. Additionally, he demonstrated excellent leadership at the last event we worked so I wanted to recognize his efforts. 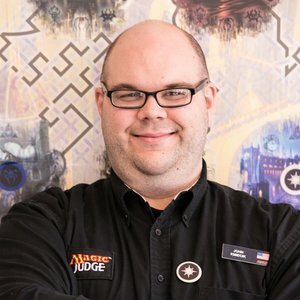 Strengths: John Kmiecik demonstrated great leadership and scorekeeping skill at our last TCGPlayer Silver Event. At the last moment, our typical venue was taken by a different event which took me by surprise, but not John. Despite the circumstances, John did not forget why we are part of this program, to enable Magic the Gathering that is both fair and fun. With that in mind, he first calmed me down because I was not taking it well. Then he quickly found a new area to host our tournament, added additional chairs/ tables, and worked around not having internet or a working clock. Despite all these challenges, we still managed to launch the event on time due in no small part to John’s leadership and hard work. During the tournament he made both scorekeeping and Head Judging look effortless. It was John’s skill and leadership that made that Silver event a successful one. Areas for Improvement: An opportunity for John moving forward would be mentorship of other judges. 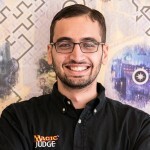 John has great scorekeeping skill and I’d like to see John pass that knowledge along to other judges given the unique challenges of scorekeeping competitive MTG events. Another opportunity for John would be scorekeeping at larger events. I believe by taking on greater challenges we not only improve but we also learn which skills are actually important which makes mentoring that much easier. I hear that becoming a level 2 judge is great way to find those new opportunities. Comments: John is an excellent scorekeeper and leader. He can become even better by taking on new challenges and passing along more of his knowledge to other judges. Regardless I am confident that any event that staffs John will be fantastic for both players and judges alike. Using the third person when addressing John gave the review a less personal feel; if I could go back and rewrite it, I’d write the review as if I were talking to him directly. When I wrote this review two years ago, I was overly worried about being hypercritical, about pointing out flaws that didn’t actually exist. The area of improvements could’ve focused more on the event itself but due to that pesky fear I took a different path. Instead of pointing faults that may or may not be correct I suggested a new way to apply his considerable strengths. I figured he could use his strong mentorship and scorekeeping skills to mentor new scorekeepers. Just because they’re John’s strengths doesn’t mean he can’t improve them. By offering new ways to apply his strengths, I could offer areas for John’s growth without worrying about the how right or wrong I was about any of his faults. Since then, I’ve stopped worrying about pointing out the faults I see. However, framing a subject’s strengths as a platform for new development is a tool that I still use to this day. So the next time you’re looking for areas of improvement, remember that strengths can improve too.